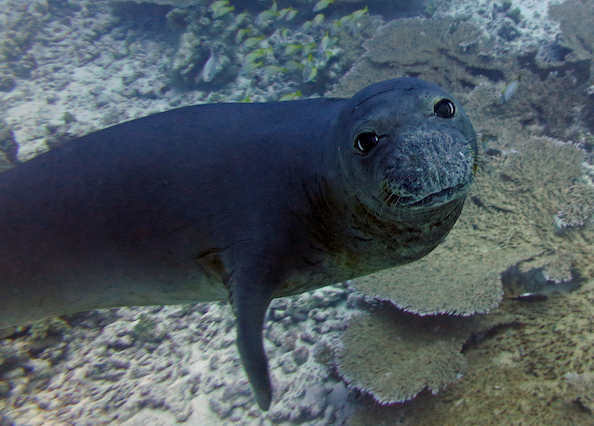 Hawaiian monk seals, which were nearly hunted to extinction in the 19th century, now number about 1,400 throughout the Hawaiian archipelago. In recent years, the population has been reduced by a number of threats, including toxoplasmosis, a deadly disease caused in part from contaminated runoff from development. 'The Orca Docs' is a two-part series that explores efforts to provide medical rescues for Puget Sound’s endangered killer whales. Part 1 asks: When should medical experts intervene to save a killer whale? and explores how scientists are preparing to treat endangered southern resident orcas that face starvation and risks of disease. Part 2, Wildlife rescues may inform orca strategies, looks at how veterinarians have intervened with other animals in the wild, and how this might apply to the situation here in Puget Sound. Several years ago, concerns were running high about the deadly morbillivirus, which was implicated in a large die-off of Mediterranean monk seals and may have contributed to the extinction of Caribbean monk seals. In Hawaii, monk seals might not only be susceptible to phocine morbillivirus (associated with seals), but also cetacean morbillivirus, which killed off a large number of bottlenose dolphins on the East Coast. They could also fall victim to canine distemper virus, a morbillivirus found in unvaccinated domestic dogs. A vaccine developed for ferrets was shown to be effective for captive harbor seals at SeaWorld in Texas. The island of Oahu was chosen for a pilot study on monk seals in 2016, because the 44 animals in that area could be identified and observed. Through careful studies of contact among the seals, researchers determined which animals should be vaccinated as a high priority to achieve the greatest “herd immunity” for the population at large. Two shots, about four weeks apart, are required for full immunity. The federally approved effort involves many details — from keeping the vaccine cold on warm beaches to training people how to get close to the seals and use a long pole to administer the vaccine. Since 2016, the vaccine has been given to more seals in the Central Hawaiian area, expanding to more distant areas in 2017 and 2018, according to Michelle Barbieri, a veterinarian with NOAA’s Hawaiian Monk Seal Research Program. This program, which has effectively protected at least half the population, is close to reaching the desired herd immunity. It is the first-ever species-wide vaccination program for wild marine mammals. Hawaiian monk seals still face a variety of threats, from shark attacks to entanglements in fishing gear to starvation, Barbieri said, but more of the sick and injured animals are being treated in the wild or taken to Ke Kai Ola, a monk seal hospital in Kailua Kona. “We now have some positive signs of population stabilization and even growth,” she said, noting that the morbillivirus vaccine stands to prevent a widespread outbreak if the disease suddenly appears. Whether a vaccine will ever be developed to protect wild killer whales, such as the critically endangered southern residents, is open to speculation. Hendrik Nollens, lead veterinarian for SeaWorld parks, said SeaWorld maintains pathogen-free seawater for its marine mammals, to minimize the risk of disease. But the parks do vaccinate all their orcas against Erysipelas, a bacterium that can infect the orcas via the fish they eat. If infected, a whale can die within 24 hours. Work on developing the vaccine against Erysipelas could provide valuable information for the development of other potential vaccines for killer whales, Nollens said, but it would take a great deal of study before any vaccine would be used on the southern residents. Cetacean morbillivirus is a theoretical concern, he said, but so far the organism has not become a threat in the Pacific Ocean. Helping southern residents get enough food to eat remains the top priority. EoPS: The orca docs - When should medical experts intervene to save a killer whale?